Wondering how to choose sunglasses that’ll flatter your face shape and accentuate your best features? You’re not alone. It’s a question we get asked frequently at Eyewear Avenue and over time we’ve learned more than a few practical tricks. Our experience with thousands of customers has helped us to identify a step-by-step process to choosing your perfect pair. Most of us look for both style and practicality in our sunglasses. You probably want a pair that’ll protect your eyes from the sun’s ultraviolet rays and look good while they’re doing it! UV rays can be incredibly damaging to our eye health. The World Health Organization states that ultraviolet rays are linked to macular degeneration, cataracts, and even cancer. UVB rays are a particular contributor to these conditions, which can eventually lead to vision loss. Sunglasses also stop us from squinting in the bright sunlight, which can lead to wrinkles and crows feet (as well as annoying headaches). By protecting the eye area, you not only stop harmful damage but reduce signs of aging too. So, how do we choose the best pair? 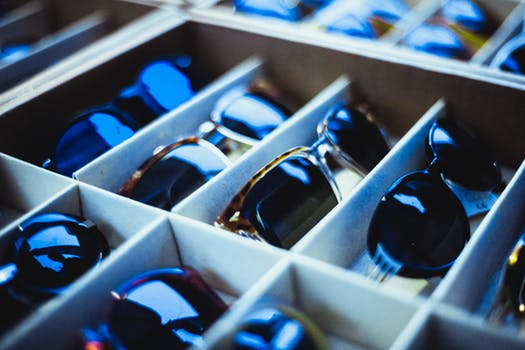 Before we dive into how to choose sunglasses, let’s talk about some fundamental guidelines. 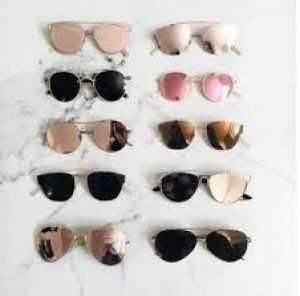 Choosing sunglasses is mainly about your face shape. It can have a huge impact on which styles of sunglasses look best (and which don’t suit you at all). 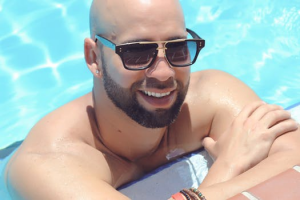 In fact, face shape is the key determining factor when it comes to which sunglasses look good on you. What many people don’t realize is that choosing the right sunglasses is all about balance and contrast. Most people just look at the styles on offer and try the ones they like best. It’s not a bad approach, but it can often lead to people buying eyewear that doesn’t bring out their best features. By taking a more strategic approach, you can a narrow down your search to the styles that are most likely to suit you instead of looking at every single pair. By following the rules of balance and contrast, you’ll be able to find the perfect pair of sunglasses for your unique face. Balance is all about choosing glasses that work in harmony with your proportions. Choosing glasses that are too big or too small can upset the overall balance of your look. Contrast is about choosing styles that stand out against your face shape rather than mirroring it. So, if you have a square jaw, then you’ll want to avoid rectangular sunglasses. Conversely, if you have a round face, then angular glasses are likely to look really good. As a general rule, sunglasses that mimic a face shape don’t tend to look great. Whereas sunglasses that contrast it usually look awesome! The tricky thing about how to choose sunglasses is that we often can’t put our finger on why a pair don’t suit us. We’ll know they don’t look quite right but can’t articulate exactly what’s wrong with them. Many people just settle and buy an average pair that ‘do the job’. 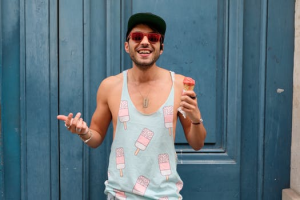 But, by following our guide you’ll be able to identify the exact styles that’ll suit your face shape and hunt down the perfect pair of summer shades. Let’s look at how to choose sunglasses in more detail. The first step to choosing sunglasses is to work out what kind of face shape you have. Oval – an oval face shape tends to be longer than it is wide. Round – a round face shape is usually widest at the cheekbones and may have a similar width to height. Square – a square or rectangular shaped face has a wide forehead and strong jaw. Heart – a heart-shaped face has a wider forehead and narrow or pointy jawline. If you’re unsure after reading the descriptions, then try taking a photo of your face and analyzing that instead. Be sure to take it straight on and from eye level so there aren’t any awkward angles that can distort the true shape. Trace over it if you need to, in order to accurately determine your fundamental face shape. Some people do this with a mirror, using soap or a dry marker pen that can be easily washed off afterward. Handy hint – use a headband to keep all of your hair away from your face. Bangs, fringes, and layers can all alter the look of your face and cause you to identify your shape incorrectly. Once you’ve identified which face shape you have, it’s time to address the matter of how to choose sunglasses. The good news is that there’s no single style of sunglasses for one face shape – all can suit a varied range. So, if there’s a pair that suits your face shape, but you don’t particularly like the style, there’ll be other options to choose from. Let’s look at each of the face shapes in turn, to see which sunglass styles are best suited to them. Round faces look good with sunglasses that contrast it. So rather than going for round frames, choose a square, retro square, wayfarer, or cat eye style to offset the roundness. Angular frames or ones that are oversized usually look particularly good. You’re best off going for something structured, rigid, or square. People with round faces should avoid circular designs, aviators, or shields. As with oval faces, the combination of roundness breaks the rule of contrast and creates an unflattering look. You should also avoid wispy frames or soft edges. People with square-shaped faces tend to have strong features, so sunglasses that work in harmony are your best bet. Go for styles with rimless edges or soft lines rather than chunky frames. Round, aviator, and shield style sunglasses will all work well. People with square-shaped faces should avoid angular glasses like a cat eye, wayfarer, or square designs. These styles will accentuate the angles of your head and jawline rather than contrast them. Heart-shaped faces can get away with pretty much anything. This is because both square shapes and round shapes will contrast your face shape. Frames that are wider at the top than at the bottom will also compliment your look. So, retro square shapes, cat eye, and sports sunglasses could all work well. It’s also important to choose sunglasses that are the right size for your face. This ensures that your overall look is balanced, which is one of the fundamental rules we talked about earlier. It is recommended that you buy sunglasses that are the width of your cheekbones, not the width of your entire face. If they’re wider than your cheekbones then they’ll look too big, and if they’re narrower than your cheekbones then they’ll look too small. Either of these situations will upset the balance so your sunglasses won’t look as good. Another important factor in how to choose sunglasses is the color of the frame. Should you go for a light color or dark color? One that’s in fashion or a timeless classic? The color of your sunglasses can have a big influence on the balance of your face and longevity of your glasses. After all, burnt orange may be the hottest color this season, but this will probably mean that it dates quickly. In truth, there are no hard and fast rules on how to choose sunglasses in the right colors. It will depend on your fashion preferences, hair color, complexion, face shape, and personal preference. However, thinking about balance and contrast will set you on the right path. If you have blonde hair, pale skin, and a square shaped face, then thick black-rimmed sunglasses may not deliver the best look. The stark color contrast and emphasized angles won’t look balanced. However, a softer color such as brown or tortoiseshell in an aviator-style design is likely to compliment your look. When it comes to how to choose sunglasses in the right color, it may take some trial and error. Using the face shape guidelines, you’ll already know which frame styles will suit you best. From there, it’s a case of trying them on in different colors until you hit on a winning combination. When thinking about how to choose sunglasses, it’s not just the frames that are important. Your choice of lenses can dramatically change the overall look, as well as influencing practicality. Good quality lenses will reduce glare and protect your eyes from harmful UV rays. Here are a few different types of lenses to consider. The key benefit of polarized lenses is that they reduce glare substantially. If your eyes are particularly sensitive or you take part in water sports, then polarized lenses can be especially helpful. However, it’s worth noting that the tint in certain windshields can react with some polarized lenses to create blind spots. Certain combinations can also reduce the visibility of LCD-style readouts inside and outside of the car. So, depending on the type and make of transport you use, mirrored lenses may be a more suitable alternative. Photochromic lenses are clever little options that adjust automatically to your surroundings. They can adapt to different light intensities as well as changing weather conditions, which makes them particularly versatile. On darker days the lenses get lighter, and on brighter days they get darker. However, they do take a little longer to work when conditions are cold versus warm. If you tend to use sunglasses in lots of different conditions, then interchangeable lenses may be for you. They come in a range of different colors with the ability to be removed and replaced with alternatives. Not all styles of sunglasses support interchangeable lenses, however, they do allow you to personalize your eye protection based on your individual activities and the weather conditions you spend the most time in. If it’s important that you have reliable sunglasses that can perform in a variety of usage situations, then interchangeable lenses are a great option. So, now you know exactly how to choose sunglasses that’ll look stylish and meet your practical needs. The basic rule of thumb is to go for the opposite shape to your face. So, if you have a round or oval face, then choose angular styles like wayfarer or retro square designs. If you have a square or rectangular face, then rounder styles like aviators and shields will look better on you. The only situation where this rule doesn’t neatly apply is for people with heart-shaped faces. In these cases, you’ll want sunglasses that are wider at the top than at the bottom (like the cat eye or wayfarer frames). Whatever sunglasses you choose, be sure that they provide complete UV protection. Choosing style over substance can compromise the health of your eyes and lead to visual deterioration. Check out our extensive range of stylish sunglasses with 100% UV protection here.